LANDRIÈVE DES BORDES, JEAN-MARIE, chief king’s scrivener and commissary of the Marine; b. 12 Aug. 1712 at Aubusson, France, son of Gabriel-Alexis Des Bordes Landriève, presiding judge of the province of Marche, and Marguerite Mercier; buried 21 May 1778 at Artanes (dept of Indre et Loire), France. 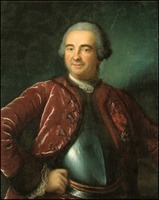 Jean-Marie Landriève Des Bordes arrived in Canada towards the end of the 1730s. In May 1740 he was in Montreal, where in addition to engaging in trade he was employed as an inspection clerk in the king’s stores, a job for which he was commissioned on 21 Oct. 1741. As he was satisfied with Landriève’s services, the minister of Marine, Maurepas, granted him letters patent as king’s scrivener on 23 Jan. 1748. 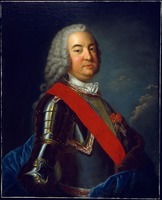 In 1751, following à visit to France on personal matters, Landriève returned to Canada at Intendant François Bigot’s request in order to serve as chief scrivener at Detroit. The next year he was commissioned subdelegate of the intendant for Detroit, to succeed Robert Navarre. The office was resumed by Navarre in ]754, when Landriève was recalled to Quebec; there he was put in charge of the quartermaster and pay services for troops in the governments of Quebec and Trois-Rivières, replacing Jacques-Michel Bréard. He became one of the confidential agents of the intendant, who entrusted him with the inspection and management of the forts in the pays d’en haut from La Présentation (Oswegatchie, now Ogdensburg, N.Y.) to Fort Duquesne (Pittsburgh, Pa); he carried out an inspection in 1755. 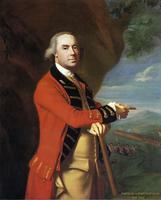 In 1758 he served as commissary at Fort Carillon (Ticonderoga, N.Y.). At the time of the conquest, in keeping with article 20 of the terms of surrender for Montreal, Landriève was chosen by Governor Vaudreuil [Rigaud] for the office of commissary with responsibility for the king’s affairs in the colony. He got along well with the British authorities, who showed high regard for him. Indeed Thomas Gage, governor of Montreal, and his wife were present on 23 June 1761 at the signing of the contract for Landriève’s marriage with Marie-Gilles, the youngest daughter of Gaspard-Joseph Chaussegros* de Léry, the king’s engineer in New France. Also present were various French military officers and Jacques-Joseph Lemoine Despins, with whom Landriève had done business during the final years of the French régime. Landriève declared that he was bringing 200,000 livres in cash to the joint estate, and his wife 12,000 livres. At that time, according to the author of the “Mémoire du Canada,” Landriève’s fortune was estimated at 900,000 livres. In France, however, Landriève was accused at the Châtelet of having participated in the breaches of trust committed by Bigot and his circle, in particular as a member of an association of merchant-traders with François Maurin*, Joseph-Michel Cadet, and Jean Corpron*. On 10 Dec. 1763, after due investigation, he was accused of failure to appear in court, and he was found guilty of having received gifts from Cadet, signed false statements, and forged or signed false bills for the purchase from Maurin, Corpron, and Cadet of supplies that were paid for but never delivered. The court of the Châtelet sentenced him to be banished from the city of Paris for nine years, to pay the king a fine of 500 livres, and to make 100,000 livres’ restitution to the state. Landriève returned to France on the Chevalier de Lévis in January 1765. He immediately asked for and obtained a safe conduct for six months, on condition that he give himself up at the end of that time to face the sentence hanging over him. In June of that year he demanded a new trial and spent all his time justifying his conduct in Canada. On 24 Nov. 1766 the court of the Châtelet acquitted him of all charges and declared him blameless in the affaire du Canada. Once exonerated in France, Landriève insisted upon clearing his name completely in Canadian eyes by publishing letters and messages in the Quebec Gazette, the only one of the 55 accused officials who took such action. In 1769 he obtained from the king letters patent as a commissary of the Marine and a pension of 600 livres. In the summer of 1770 Jean-Marie Landriève Des Bordes left Paris and retired to his property at Artanes, where he died in May 1778. According to his nephew, François-Joseph Chaussegros de Léry, he left his wife and three children “a respectable fortune.” His two sons went into the king’s service, Antoine-Gilles joining the king’s bodyguards, and Pierre-Paul the colonial regular troops. AD, Indre-et-Loire (Tours), État civil, Artanes, 21 mai 1778. AN, Col., B, 71, f.43; 74, f.18v; 84, f.17; 87, ff.11, 11v; 89, f.15; 91, ff.32, 32v; 113, f.273; 164, f.347; C11A, 93, f.264; 96, ff.54, 54v; 105, ff.199, 382, 407, 409; E, 253 (dossier Landriève Des Bordes). ANQ-M, État civil, Catholiques, Notre-Dame de Montréal, 25 juin 1761; Greffe de Pierre Panet, 23 juin 1761. [F.-J. Chaussegros de Léry], “Lettres du vicomte François-Joseph Chaussegros de Léry à sa famille,” ANQ Rapport, 1933–34, 55. Inv. des papiers de Léry (P.-G. Roy), II, 289; III, 54–56, 113, 135–41, 146–50, 157–60. “Mémoire du Canada,” ANQ Rapport, 1924–25, 174, 187, 197. PAC Rapport, 1899, suppl., 182–83; 1905, I, vie partie, 72, 108, 130, 319, 359, 361, 364, 383. Quebec Gazette, 14 May, 26 June 1767, 2 Feb. 1769. J.-E. Roy, Rapport sur les archives de France, 875, 884. P.-G. Roy, Inv. ord. int., III, 16, 169, 185, 189, 191. Tanguay, Dictionnaire, V, 127. P.-G. Roy, Bigot et sa bande, 168–72. [P.-]P.-B. Casgrain, “Landrieffe,” BRH, II (1896), 45–46. J.-E. Roy, “Landriève,” BRH, II (1896), 89–90. Benjamin Sulte, “Jean-Marie Landrieff,” BRH, II (1896), 50–53. André Lachance, “LANDRIÈVE DES BORDES, JEAN-MARIE,” in Dictionary of Canadian Biography, vol. 4, University of Toronto/Université Laval, 2003–, accessed April 24, 2019, http://www.biographi.ca/en/bio/landrieve_des_bordes_jean_marie_4E.html.